Make one batch of the classic Beef Chili Five Ways to enjoy on Monday night. On Tuesday night add in a few simple ingredients and you’ve got a totally new take on last night’s dinner. With a few south-of-the-border items, you’ve got a Mexican variation for your daughter or choose the Italian-style for your son. 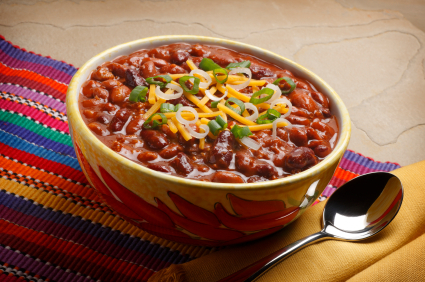 This is a visually pleasing, hearty chili with a wonderful texture and slightly smoky taste - spicy, but not too hot. It is made with Ground Beef, Pork BBQ, Andouille Sausage, Beans, Vegetables, and Spices. Texas Red Chili is the only real chili! Real Texas Red Chili is made with Chuck Steak and no beans. This is a great Recipe. Now this is some tailgating chili.